This is a great idea, although I enjoyed mixed success when I tried it. I've included two examples below: one which worked, and one which didn't. This feature is meant to work like the Fill by Example feature in Excel, which has been around for a while now. It should be straightforward to extract the release year from the parentheses. 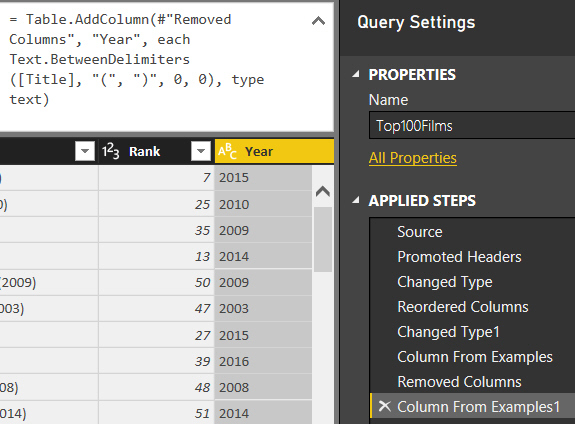 Here I'm using a single column, but you can get Power BI Desktop to guess how you want to combine multiple columns also. The putative new column appears on the right of your table. For this example, one entry was enough. Power BI Desktop has guessed my intentions. 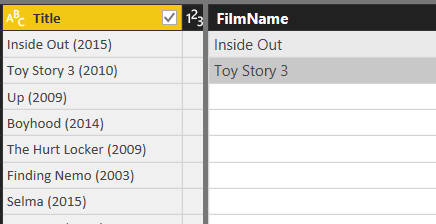 Although the column formula shows up, you can't edit the transform created by double-clicking on it. All very impressive - let's now have a look at an example where this didn't work. In fairness, Microsoft say that they are planning on developing this over the next series of updates. Some film names are there, but some include the year still. 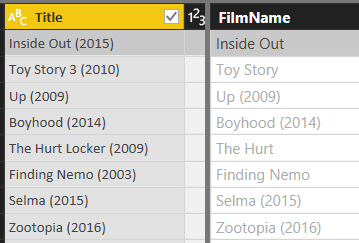 And so it continues - I tried typing the first five film names in, then gave up. This is implemented in a really nice way, and for examples where it works will be very useful.